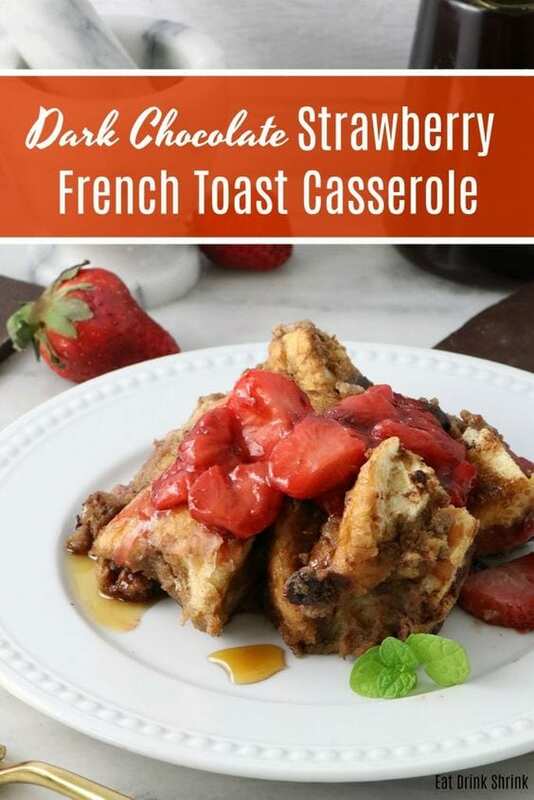 Vegan Dark Chocolate Strawberry French Toast Casserole - Eat. Drink. Shrink. If I had to say it, I’m a French Toast Gal, not a pancake person! (truth) While you can’t go wrong with pancakes, there is something about french toast that I just gravitate more towards. That being said, I’ve done a few French Toast Casserole concepts because I find that they are just so much fun to make! Unlike pancakes that you have to make one by one, casseroles are so seamless. You literally throw everything in a dish, place it in the fridge and then pop it into the oven. You just can’t beat that. With it being the week of Valentine’s Day and having a craving for a breakfast concept, this recipe for vegan Dark Chocolate Strawberry French Toast with a champagne berry sauce seemed perf! While I typically stick to my normal routine of avocado toast in the morning M-F, sometimes I like to indulge, and we should all embrace that lifestyle. For those who look at this dish and all they see is calories, I’ve been there: I’ve been plant strong, vegan, raw vegan, but today my diet isn’t black and white. I rarely take time to discuss my full time diet here as it brings about negative energy and I equate it with politics, it’s just something to avoid on a large platform. My diet has shifted over the years, but will forever remain to be plant based. I don’t identify as a vegan or vegetarian, but more as one who listens to their body. You won’t catch me eating red meat, dairy, pork, etc, but if I’m craving a free range egg, I eat it. If I’m craving shrimp or tuna every now and again, I eat it. I feel that over time the plant based movement has facilitated wonderful change, but it simultaneously gave birth to the idea that something “isn’t healthy enough” and perpetuates eating disorders resulting in many masking their disorder by consuming a plant based diet. Remember, V Day is a time to celebrate love, and the most important love, is self love. Be kind to yourself, and always embrace flexibility in your diet! What I love about this recipe, is everything! It’s fun, easy, festive, has minimal ingredients, a hint of berries, a hint of chocolate, a touch of champagne, and is perf any season, and perf for entertaining! If you love strawberries, chocolate, effortless eats, or entertaining for brunch, you have to try this recipe for vegan Dark Chocolate Strawberry French Toast Casserole with champagne berries! Champagne berries put it over the top! In a bowl add the FYH eggs with almond milk, whisk, combine, set aside. In another large bowl, whisk together almond milk, coconut sugar, nutmeg, cinnamon, and vanilla. Now add the vegan egg. Lightly coat a 9x13 baking dish with oil. Slice and cube the bread, and place a layer of bread cubes evenly into the baking dish. Top with strawberries and dark chocolate chips, toss them around to disperse evenly or switch off with each layer. Pour the wet ingredients evenly over the top. Make sure 95% is covered in the mixture with a few not. Store covered overnight in the fridge. Preheat the oven to 375 degrees. Throw all of the crumbled ingredients together, layer over the top and bake for 20 mints or until golden brown. While baking make the sauce! In a pan over medium heat add the strawberries, sugar, champagne or water. Let the sugar dissolve, bring to a boil, reduce to a simmer for 5-7 minutes until slightly thickened. Serve french toast casserole with sauce!